I had many pleasant surprises because of my blog and among them there is the discovery of David Moody. I loved his novels in the “Hater” trilogy, the first novel of the series, “Hater”, a bit more than the second, “Dog Blood”. But both of them were very interesting and with plenty of good things to be found, especially Danny McCoyne, who is a strong character. The conclusion of David Moody’s trilogy, “Them or Us”, is due to be released in the US on November by Thomas Dunne Books and in the UK on December by Gollancz. It is one of the novels that I am eagerly looking forward to read this year and find the conclusion of this fine trilogy. Although there is plenty of time until then we can admire the cover art of the US edition of David Moody’s “Them or Us”. It steps away from the line of the first two covers, but I have to say that it looks good. 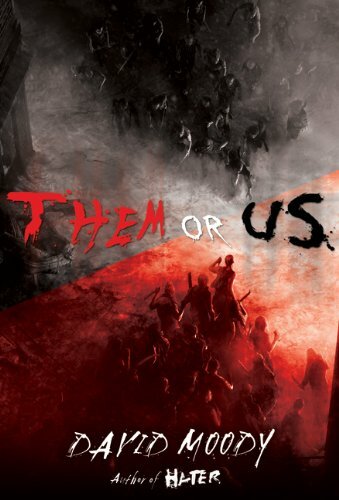 The conflict and its fatality found in the novel’s title, “Them or Us”, is projected on the artwork of the cover, in the two groups facing each other, the colors of the lettering and of the cover. I find it very appropriate. David Moody has a blurb for “Them or Us” on his website, but I would not recommend it for those unfamiliar with the series, because it contains some spoilers.